In any field, there is a vocabulary used by “experts” that makes them feel they belong to the same tribe. That applies, with no exception, to the startup world. 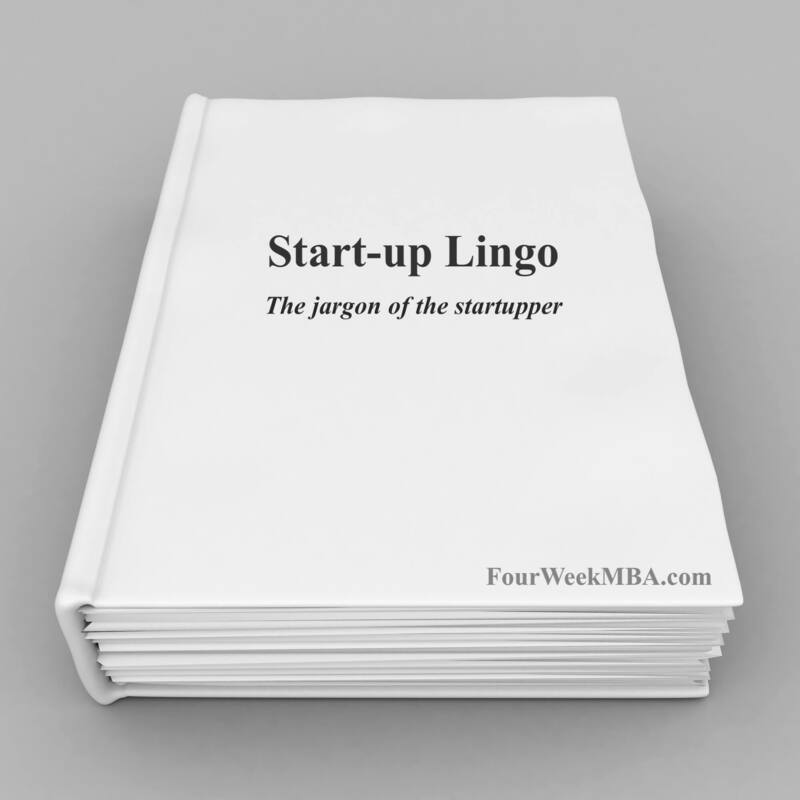 In fact, startuppers have a jargon of their own which can make it very hard to keep up. There isn’t a story better than the other. That is storytelling created ad hoc by companies (in the first case by Hollywood’s production corporations, in the latter a tech company) around an industry, which also contributes to their financial success. It is important not to forget that. I want to show you the key concepts you have to get familiar with to avoid getting caught in the trap of believing startuppers are too smart to be understood. Additional terms from the financial industry you might want to know! Today scaling up a startup isn’t just about the product but primarily about the Business Model. In short, a business model is a way a company monetizes over time. How many Business Model exist? Think about two simple examples. A startup has created a software. That software can be sold for a monthly fee. This kind of business model is called “subscription-based” because to make it work you have to have customers willing to renew the subscription each month. Therefore, you have to find ways for your customers to keep their interest in the product high. Another example is the “Freemium” business model. In other words, some companies have two versions of a product: free and paid. They use the free product as a hook to get new potential customers. Once those customers get used to the product, they make money by convincing users to become paying customers. Why is the business model relevant at all? First, based on the business model a company will “behave in a certain way.” From the previous example, a subscription-based company with no Freemium will find right away strategies to get paying customers. Instead, a Freemium based company will focus more on funnel optimization to convert users into customers. Second, it tells you what metrics to look at. For instance, if you have a software service with a monthly subscription, metrics as CAC, LTV, ARR are crucial. How many business models can you find in the entrepreneurial world? The answer should be: your creativity is the limit. Short Definition: figure out how to make money, now! As we’ve seen a business model is a way for a startup to create value. Once you’ve defined the business model, you need a set of metrics to measure how’s the startup doing overtime. That is called a key performance indicator (or KPI). It is a key term in the jargon of the startupper and one of the first terms you’ll hear in the startup world. Short Definition: can you just tell me if we’re making money? This is short for a minimum viable product. That is a product that is good enough to satisfy early customers. The real aim of this phase is to start getting feedback from the first users and understand how to improve the product to get it to the next phase. It has enough value that people are willing to use it or buy it initially. It demonstrates enough future benefit to retain early adopters. It provides a feedback loop to guide future development. Short Definition: Hey, would you be willing to give me a dime for this stuff? How do you know the MVP you’ve put together is ready to scale up? Venture capitalist, Marc Andreessen, and Growth Hacking founding father, Sean Ellis help us assess that. There is an incredibly wide divergence of caliber and quality for the three core elements of each startup — team, product, and market. By analyzing the patterns that we’ve been observing in his experience as a venture capitalist, the third aspect, the market is the most important. The #1 company-killer is lack of market. When a lousy team meets a great market, market wins. When a great team meets a great market, something special happens. You can obviously screw up a great market — and that has been done, and not infrequently — but assuming the team is baseline competent and the product is fundamentally acceptable, a great market will tend to equal success and a poor market will tend to equal failure. Market matters most. The only thing that matters is getting to product/market fit. Product/market fit means being in a good market with a product that can satisfy that market. Sean Ellis, one of the founding fathers of a relatively new discipline, “Growth Hacking” which helps startups to scale up faster with a low budget and a rigorous “scientific process,” to test as many strategies as possible to figure out what work and what doesn’t. Sean Ellis offers a simple metric to determine whether your startup is close enough to the product-market fit: the 40% rule. In other words, at least 40% of your customers must consider the product a must-have. They must be disappointed to know you’re withdrawing the product from the market. Short Definition: Hey, would you keep paying for this stuff? Short for Customer Lifetime Value, that is one of the KPI used by startups to assess whether or not they’re using the right strategy to scale up. In fact, the customer lifetime value tells you how much; on average, a single customer is paying for a product or service before he leaves. For instance, let’s say you sell software for a $10 per month fee. If customers on average keep paying the monthly fee for about six months, then your LTV is $60. This number is significant because it also tells you how much can you spend on marketing budget to acquire new customers. For example, if you’re spending $100 on Facebook ads to get one customer that has an LTV of $60, then you’re on the right path to kill your startup. That is why once you’ve figured your LTV you can assess the right CAC. Short Definition: Are you doing enough to keep me onboard? Short, for customer acquisition cost, that is tied to the lifetime value of a customer. In short, those two metrics have to be used in conjunction. Customer acquisition costs can take into account variable and fixed costs. For instance, for a SaaS (Software as a Service) the support is also a vital aspect of retaining a customer. Think of a customer that has activated a trial of a software. During that trial, the customer has activated the service, but the startup didn’t earn any revenue yet. The support, training and other costs associated with retaining the customer until he/she pays the service are all costs that need to be taken into account. Case study: Imagine this scenario, a SaaS business often starts with a free trial. Let’s say advertised with a Facebook ad. The startup has spent $50 on ads to get a user onboard. The user has activated the trial, which will last fourteen days. Before the fifteenth day, the startup won’t make any revenue. Additional costs, such as training and support might be also incurred, for a total of $40. How much did the startup pay to acquire the customer and make a revenue? You have to take into account the Facebook ad ($50), the training cost ($20) and the support cost ($20). Therefore, the startup has spent $90 just to get a single paying customer. Computing the CAC is vital to make sure the startup business model is sustainable in the long term. In fact, often startups neglect hidden costs of acquiring customers. Take content marketing. It is a great way to get new customers. In fact, this strategy can be effective for the whole sales funnel: from awareness to acquisition retention. However, to produce great content, it takes quite some time. If you’ve spent two days drafting a how-to that will convert two customers, you have to compute those two days as a CAC. Thus, if two days of your work are worth, let’s say $200, that is your CAC. Short Definition: How much are you spending to get someone onboard? That is a fictional and ideal process through which a potential customer goes through before he becomes a loyal customer that hustle your product or a brand ambassador. When you first contact someone out of the blue. That person doesn’t know you, neither trusts you. Why then would buy anything for you? Therefore, selling something is out of the question, unless you get very lucky. Also, asking for someone to buy right away it is almost like asking the person to marry you on the first date. That would be nuts! In addition, it also shows that you don’t care enough to have spent some time researching what that person might be looking for. In short, you’re not creating value first! Thus, in that stage rather than thinking about closing, you have to start building trust and get to a second date. Once the person agrees you’re improving your chances of success. The main point here is that the sales funnel helps you think in steps, rather than “I sell you this.” Instead, going through the whole funnel is like going from a coffee with a potential romantic partner, to finally getting married. How do sales funnel look like? Before you get too much in love with the sales funnel, keep in mind that is only an abstraction to help you out create a sales process. Therefore, that is a mean to an end, which is to understand you can’t get out and give a shout to anyone to buy your product. First, you might want to bring a potential customer through the steps necessary to build enough trust to start a business relationship. In fact, for many salespeople, the sales funnel becomes a sort of religious thing to follow with orthodoxy. In reality, potential customers might take unpredictable journeys. However, it is good to start with a model that helps you being consistent. Short Definition: Would you marry me, but first let’s have a coffee? There’s one thing that makes startuppers – especially those working in SaaS B2B – have nightmares during their dreams: the churn rate. That is a ratio that tells you how many customers are leaving. For instance, if you had ten customers at the beginning of January, and seven at the end of the month, your churn is 30% (10 – 7 / 10). The churn rate is one of the KPI to look at on a daily and weekly basis to make sure the business is sustainable in the long run. Your B2B customer has been acquired, and the buyer uses a different service. Short Definition: Please, don’t leave me! I promise this time it’ll be different! The conversion rate is another obsession of startuppers, marketers, and anyone that is trying to build a business online and offline. There’s merely the number of people that take a specific action which can benefit your business in some way. Therefore, when people behave by following the intended goal you set that is how you convert. There isn’t a single conversion rate or metric but as many of what you’re trying to measure. For instance, if you have a blog, which makes money with affiliate marketing, then you might want to estimate how many visitors on a page click on the affiliate link. If you get 1,000 visitors and 100 clicks on the affiliate link, the click-through rate is 10%. What is a reasonable conversion rate? What can you do to improve the conversion rate? In the Theatre world, a “Theatre Angel” is someone that takes the risk to put money to produce a show. Making a hit in a Theatre show is quite unpredictable and risky. That is why the same term was borrowed by the Silicon Valley throughout the 1970s to call early-stage investors in startups “Angel Investors.” In fact, an angel investor invests in a startup when it isn’t even making a dime, and it might never make a buck. Yet, if you get lucky enough to make a hit as an angel investor, you might earn as much as 280x your initial investment. How do you become a successful angel investor? There isn’t a framework for that. At times a successful angel investment might be due to you liking someone, rather than understanding a business. For instance, Jeff Bezos was one of the first to invest in Google, back in 1998, as an angel investor. He bought Google’s company’s stock at four cents a share. When Google went public, with an IPO in 2004, Jeff Bezos had as much as 3.3 million shares stocks. We don’t know how much of those stocks he still holds. Yet at the time those stocks would be worth at least $280 million. Based on the initial investment of $1 million that is a 280x! How did Jeff Bezos decide to invest in Google? Therefore, “love” might be as much of a factor to make you a successful angel investor, together with a lot of liquidity and a good amount of luck. Short definition: It’s all about love! Born in Paris in 1899, George Doriot moved to Boston where he after getting an MBA, he also became an investment banker and professor at Harvard Business School. When the World War II erupted, George Doriot was called in the rank of lieutenant colonel as R&D for the military planning division. Once he returned from the WWII, in 1946, he founded American Research and Development Corporation, the first publicly owned venture capital firm. The firm was founded with the primary aim of allowing soldiers back from WWII to invest part of their money in private ventures. George Doriot with his company was among the first to accept money from private investors other than wealthy families. That is how the phenomenon of venture capital was born! In short, venture capital is a form of private investing where the “venture capitalist” rarely invests in an early stage startup and more often in a “growth business” that in some ways has already shown some growth potential. The angel investor is often a private individual placing a small stake in a highly risky and very early stage startup. The venture capitalist is often part of a firm and puts his money in a company that has already been growing in the past. According to CB Insights in 2017, there were 11,042 deals and $164.4bln invested globally. The most significant piece of the pie comes from the US, with a $74.5bln and Asia follows with half of the deals but almost as much invested venture capital ($70.8bln). Europe is much smaller with $17.6bln. Short Definition: Growth is all that matters! That is the currency of the Angel Investor. In fact, when the Angel Investor agrees to put money into a venture that isn’t making a buck, in exchange for that he/she will ask for equity in return. Often seed capital might also be money coming from the same founders’ assets until they’re not attractive enough to get additional funding from angel investors. If you’re thinking about that device used to cure premature babies in the hospital that is not too far from what that is in the startup world. In fact, in some cases, new wannabe startuppers don’t trust themselves enough to be ready to challenge the furious Mr. Market on their own. That is why they go to a place, called incubator, which main aim is to bring the startup from zero to whatever objective they had set up. Twice a year we invest a small amount of money ($120k) in a large number of startups. The startups move to Silicon Valley for 3 months, during which we work intensively with them to get the company into the best possible shape and refine their pitch to investors. Each cycle culminates in Demo Day, when the startups present their companies to a carefully selected, invite-only audience. But YC doesn’t end on Demo Day. We and the YC alumni network continue to help founders for the life of their company, and beyond. Short Definition: I’ll give you a candy, you give me equity in return! When a private company becomes available to the public through stock markets, that is called Initial Public Offering. In short, anyone from the public – average Joe included – can buy a stock of your startup for the price the startup gets listed on the day of the IPO. That is the dream of many startups. In fact, the stories of startup founders that make a successful exist (meant they monetize through an IPO) have inspired many wannabe startuppers. One of the most recurring dreams for startuppers is to imagine one day to ring the bell at the NASDAQ’s opening just like Mark Zuckerberg did back in 2012! An ICO or Initial Coin Offering has the same purpose as the Initial Public Offering: find capital for the startup. In other words, in exchange for cryptocurrencies startups give part of their equity to the market. The ICO is different from the IPO because cryptocurrencies right now are underregulated. Therefore, this kind of process allows a startup to get financing way faster. As you can imagine this process bypasses the regulation also makes it a riskier business. In fact, a startup getting ready for an ICO will issue its coin by using the Blockchain technology. Those coins will be given to the investors, while the startup gets the financing. What’s next? Either those coins could be used as real money, buy goods, or just as a speculative medium based on “wait and see.” If that startup becomes successful, then the coin might be worth much more than the initial investment. When you break an NDA things can get ugly! In fact, NDA stands short for a non-disclosure agreement. A non-disclosure agreement (NDA), also known as a confidentiality agreement (CA), is a legal contract between at least two parties that outlines confidential material, knowledge, or information. One common belief among wannabe startuppers is “make a great product and customers will come!” This belief is flawed. In fact, often it isn’t the best product to win, but the one that has better distribution. That is why distribution matters so much. In short, product development and distribution have to walk hand in hand to allow your startup to gain “traction” or speed up the growth process. Also, for each growth stage, you have to figure out the strategies that work and the ones that don’t. In fact, while some approaches might work in an initial growth stage, they might stop working in the next phase of growth. This is one of the most popular business models used by startups to get traction. On the one hand, the basic product is offered for free. Instead, a more advanced version of the same product will be instead offered at a premium. That is how the freemium business model works. Although it makes sense to use the freemium business model to grow a business, it isn’t always that easy to implement it the right way. In fact, assuming you have plenty of free users, it is not guaranteed a profit from the paying ones. One example of a Freemium model that works is MailChimp, an email marketing software that allows you to build a mail list and automate part of your email marketing effort. If you want to run a successful tech company, you don’t have to follow the path of “Silicon Valley.” You can simply start a business, run it to serve your customers, and forget about outside investors and growth at any cost. As reported in the same article, MailChimp had 12 million customers back in 2016 and $280 million in revenue in 2015 and it was about to reach $400 million in 2016. MailChimp makes it very easy to use its service for free for the first 2,000 mail subscribers. The service works quite well and once you get to the point of reaching the subscribers limit it’s very hard to switch. Of course, this is based on my personal experience as MailChimp hasn’t made its metrics publicly available. Short Definition: Users are all that matters! Imagine you’re setting up a clothing shop window on a busy street of Manhattan. The way you set that up will depend on whether people will buy more or less from the store. How do you make sure that windows shop is effective? There’s one thing you can set up another windows shop on the same street. You make that window shop identical but for one variant (for instance, you place a pair of red shoes, instead of a pair of blue ones). The one that brings more customers will be also the one to pick. That would be a real-life A/B test. In other words, that is a control experiment (where you only change a variable and keep the rest unchanged, to “control the experiment’s environment”). Running an A/B test in real life would be too expensive, if at times not impossible. However, digital data allows companies to run any kind of A/B test experiments way faster. In fact, today companies like Google, LinkedIn, and Facebook run thousands of A/B test experiments each day. That is a process that borrows elements used in gaming and brings it to the startup world. One example of frameworks borrowed from the gameplay industry and brought to the startup world is the “Hook Model” by Nir Eyal in his book Hooked. Growth hacking is a process of rapid experimentation across marketing channels and product development to identify the most efficient ways to grow a business. The key terms in the definition above are “rapid, experimentation and growth.” In fact, Growth Hacking is supposed to use a rigorous – not in a scientific manner – but rapid process of experimentation, to test ideas rapidly and keep going with the ones that speed up the growth process of a business. A Unicorn Company is an organization or startup valued at over a billion dollar. Unicorn companies are the dream of many venture capitalist that seek out the next multi-billion dollar exist. Aileen Lee is a co-founder of Cowboy Ventures coined the term “Unicorn Club” to mean the companies that had reached a billion dollar mark valuation! A Decacorn Company is the big brother of a Unicorn. It is a company that has reached and passed the ten billion dollars valuation mark! Those companies are in a good position to take over the world, but still in a startup mode, that makes them willing to bet everything on massive growth! A Phoenix company is an organization that managed to survive and it thrived for over two hundred years. Opposite to the concept of Unicorn, a company that managed to overgrow and gain traction to become valuable in the short-term. A Phoenix Company is all about the long-term. Search Engine Optimisation is a marketing strategy based on using a set of tactics and best practices to rank higher in search engines page results. Why does it matter at all? When you publish content on the web, that is when things start getting complicated. In fact, billions of people each day get online. It is also true that almost as much content gets created. In the noise, it’s easy for your content to be forgotten. One way to avoid that is to make sure your content follows a set of guidelines which makes it easier for search engines to find it, and rank it. In fact, search engines like Google have billions of little crawlers (a software that looks at web pages) that at each time go through the web pages comprising the visible web. Those crawlers main aim is to form an index of web pages. Once formed this index, Google then has to rank those pages. It does so through a set of signals. One, of course, is content quality, based on how users behave when consuming it. SEO helps you do just that. Short Definition: Hey Google, get me leads! It’s a statement to be submitted each year according to U.S. SEC regulations. It needs to be presented within 90 days of the end of the exercise. This report/form is a detailed account of all the information related to the company, which submitted it. The 10K report usually contains information pertaining to business and financial profile of the organization. Also, you will also find corporate governance information and managers’ compensations. This is the main report, which the analyst will consult to extract financial data to perform an analysis. The accounting method for which sales and expenses must be recorded when occurred. This means that each time a customer buys an item, even though on credit, the transaction must be registered. Therefore, independently from cash disbursement, the transaction will be recorded in the accounting books. This method is mandatory for the company, following the SEC regulations. On the other hand, some companies are allowed to use the cash method as well. Any organization has resources at its disposal that can be used for operational purposes. Those funds are called assets. In finance jargon, assets are displayed on the balance sheet. They can be classified in the current and noncurrent. The former are the ones, which will be converted into cash within one year. The latter are the ones, which will be on the balance sheet for a few years. Also, a current asset is usually listed on the balance sheet according to their degree of liquidity. Therefore, we will find on the balance sheet the following items: cash, cash equivalents, short-term marketable securities, account receivable, inventory and prepaid expenses. The non-current assets (also called fixed assets) can be tangible or intangible. The former are physical things, such as plant and equipment. The latter are invisible things, like licenses or patents, which will have a life of few years as well. While, tangible assets are depreciated, non-tangible assets are amortized. In the business world, the supply chain is the set of processes a product has to go through before and after it is sold. For instance, a tomato sauce before it gets sold in the supermarket needs to be packaged. Before packaging comes production; Before production comes growing and farming the product. All these steps are crucial to making the product available to customers. When a company controls all the processes (like in our example), from farming to end customers, this is called vertical integration. When a company decides to move backward in the supply chain, this is called backward integration. For instance, Starbucks, which is a coffee chain, sells its products directly to its end customers. On the other hand, Starbucks also bought some farms where the coffee is produced; therefore Starbucks used backward integration to reduce its costs related to purchasing, but also to guarantee a higher quality of the final product. Financial markets are in an eternal fight to reach the point of equilibrium. In short, each time demand and offer agree on the value to be given to a particular asset or stock; that is when a price forms. Therefore, in the market, there are buyers and sellers. The former has an optimistic outlook, and the latter a negative or pessimistic outlook; When sellers dominate, a bear market forms. In corporate finance, understanding risk is crucial. But how can we define risk? This can be defined as the amount of reward to expect for each level of risk undertaken. In other words, if I take on more risk I also expect a higher return and vice-versa. The objective of corporate finance is to quantify the risk and even the expected return. How to measure it? Thru CAPM (Capital Asset Pricing Model), the leading measure of risk is Beta. Beta tells you the particular risk of company stock in comparison to the market portfolio. In short, the Beta informs you of how many units will be a specific move of stock compared to the market portfolio. Before the first black swan was discovered, in Australia, it was believed that black swans did not exist. This means that a single event (a black swan) can wipe out all the empirical evidence found until a certain point in time. This leads up to the Thanksgiving turkey problem. The turkey, which was fed for 1000 days, made a reliable assumption based on a fair number of observations that it would have always worked in that way. Until Thanksgiving Day comes and the turkey is slaughtered and eaten. Nicholas Nassim Taleb brings up these two examples, which in his book “The Black Swan” opened up the road to better understand randomness and the limits of empiricism. How does a blue ocean look like? Imagine first a red sea; plenty of sharks, which try to compete with every single fish in that water; blindly fighting against each other for a small piece of food. In such a scenario, many sharks will die, and few will survive. Imagine, instead of an open blue ocean unexplored by other sharks. The shark, which has the courage and ability to find that new ocean, will enjoy unlimited resources. What is the most successful example of Blue Ocean Strategy? Only a few years ago, I-Phone and I-Pad did not exist in the mind of consumers. Apple came out with these products. Therefore, Apple was successful in convincing consumers that those new products would have filled a real need they had; Although that need, didn’t exist a few months before. This is one of the most sublime examples of Blue Ocean Strategy. Financial markets are in an eternal fight to reach the point of equilibrium. In short, each time demand and offer agree on the value to be given to a certain asset or stock; that is when a price forms. Therefore, in the market, there are buyers and sellers. The former has an optimistic outlook, and the latter a negative or pessimistic outlook. When buyers dominate on sellers, that is when a bull market forms. An option is a financial instrument that gives the right to its holder to buy or sell a stock or asset at a determined price. The option’s owner has the right and not an obligation to buy or sell that stock. When the option’s holder bought the right to purchase the stock after a certain date, then he bought a call option. For instance, you can buy ten call options at $1 each for a stock worth $10. Therefore you spent $10 total. In one month this stock rises at $12. You exercise your right to buy ten shares, worth $12 but you will pay just $10. This means that you will own now ten shares worth $120, but you paid $100 + $10 = $110. In conclusion, you made $10 profit ($120 – $110). In the commercial real estate, CAM or common area maintenance are expenses incurred by the landlord on common areas (such as landscaping, parking lot, utilities and so on). Those will eventually be reimbursed by the tenant based on its pro-rata share of square meters in comparison to the overall commercial building. For instance, a tenant, who occupies 1,000SF in a commercial area of 10,000SF, will pay 10% of the total common area maintenance; if stated in its lease, otherwise the tenant will be not responsible for that. Why is this so important? CAM is crucial for both tenant and landlord. For the former, it is important to understand the hidden expenses resulting from a lease. For the landlord, it is important to quantify common area expenses, to determine the amount to ask for reimbursement to the tenant. There are two main categories or leases: Gross and Net. According to the lease stipulated the CAM expenses could change a great deal for the tenant. In turn, the CAM reimbursement will grow substantially for the landlord if contracted one lease or the other. Before we get to the meaning of this exotic term, let me answer the following questions: what is a central bank? What does it do? And what are the tools available to it? First, the central bank is an institution, which objective is to “stabilize” the economy and therefore financial markets. How? Central banks have different tools to achieve this objective. The two most powerful instruments are interest rates and money printing. For the sake of understanding carry trade, we are going to focus on the former, “interest rates.” In fact, when the economy slows down, usually central banks tend to lower interest rates, to allow the economy to recover and stabilize. Instead, when there is too much “exuberance,” prices of assets and commodities tend to rush, by creating what economists call “inflation.” To avoid such scenario, central bankers tend to increase interest rates. Not all central banks have the same approach, and not all central banks face the same economic scenario. Therefore, you will have countries in which the interest rate is 5% and other countries where the interest rates are between 1-2%. Speculators take advantage of such arbitrage opportunities. How? Thru so-called carry trade. In fact, they borrow money in countries where interest rates are lower and invest in countries where interest rates are higher. For instance, in Japan interest rates are close to zero. Therefore, you will borrow money in Yen (Japanese currency) and invest in the euro, where interest rates are higher. Benjamin Franklin used to say, “Cash is king.” This holds true in business and finance. For such reason, while balance sheet and income statements give a particular profile of the firm; the cash flow statement tells whether a company is making enough money to survive and thrive. In fact, the cash flow statement can be obtained by adjusting the income statement to reflect all the non-cash items that are included in it. Therefore, this statement, which has three sections: operating, investing, and financing is going to tell us where the cash is coming from. Therefore, if you are a manager, you will focus more on cash flow from operations. If you are an investor, you will concentrate more on cash flow from investing. And if you are a banker you will concentrate more on cash flow from financing. The Federal Reserve Bank is the U.S. central bank. The central bank primary role is to stabilize the economy through three main tools: discount rate, open market operations, and by controlling the reserve requirements of institutions. The FED uses discount rates to affect the economy. For instance, lower interest rates imply a less positive outlook for the economy, while higher interest rate will be used to slow down inflation when the economy is in good health. In the open-market operations, the FED indirectly controls interest rates. In fact, by buying U.S. bonds, the FED will influence the price and interest of these securities, and this de facto affects the economy. In the third case, the FED makes sure that banks and financial institutions hold reserves or funds. For instance, although banks receive billions of dollars in deposits, if they could they would lend 100% of this money, to maximize their profits and also avoid costs associated with keeping money into their vaults. Therefore, the FED determines the % amount of deposited funds to keep as reserves, for emergency situations. Wilfred Pareto was an Italian economist (he was a polymath) that lived across the 19thand 20th century. At the end of the 19th century, Pareto found out that most of the wealth of the population was in the hands of few. This observation became the 80/20 principle, which states that 80% of the effects is given by 20% of the causes. The 80/20 is just indicative, and there are phenomena, which go beyond the 80/20. For instance, new observations show that 0.1% of the U.S. population owns 22% of the household income. The Pareto principle can be extended to any other field, and why not, also personal life. What is that 20% of your daily activities that gives you 80% of joy and happiness? The pecking order theory was first formulated outside finance, and it related to the social hierarchy existing in the animal world. This theory was reformulated to fit the investment world. In short, the pecking order states that a company can finance itself through three primary sources, internal funds, debt issuance, and new equity issuance. Managers based on the necessity of the organization pick those three. In normal conditions, the firm will finance itself through internal funds or debt. As for last resort, the company would use equity. The reason stands in the fact that there is asymmetry of information. Managers know more about the enterprise, that external investors do. Therefore, if managers “pick” new equity as a financial option, it means that they believe the stock to be overpriced. Instead, when the management is confident about the value of the firm, they will issue debt or use internal funds. Hey Gennaro really enjoyed this startup bingo post. Cheers! Thank you, Richard! A lot of research behind it. Really appreciated!